Broken turbine blade at DTE Energy’s wind park in Sigel Township, MI. Crews are investigating how a 160-foot, 7-ton wind turbine blade broke in Sigel Township, MI, leaving it corkscrewed around the base structure. The damaged blade is on one of DTE Energy’s 40 turbines in Sigel Township. DTE said it happened at 3:15 p.m. Friday. The access road to the turbine remains closed. DTE Regional Manager Ron Chriss said DTE and Duke Energy were first on site and crews took immediate steps to secure the area. DTE said it noticed a turbine fault while monitoring from its Cass City location and got a call from a landowner. Crews are investigating but haven’t determined a cause for the break, Chriss said. The utility is working with General Electric, the blade manufacturer, to finalize plans to safely remove the broken blade, he said, adding GE is now at the site. DTE expects an “extended outage” for the turbine during repairs and while “extensive top to bottom inspections of the entire turbine are conducted,” Chriss said. DTE said the turbine automatically shut down after the incident. Photos show the blade broken in at least two spots. The blade, which DTE said consists of carbon fiber and fiberglass, twists overtop the turbine’s nacelle, pointing downward and hanging between two other blades intact. In March 2013, a turbine blade, also in Sigel Township, broke because of a manufacturing defect, according to General Electric. 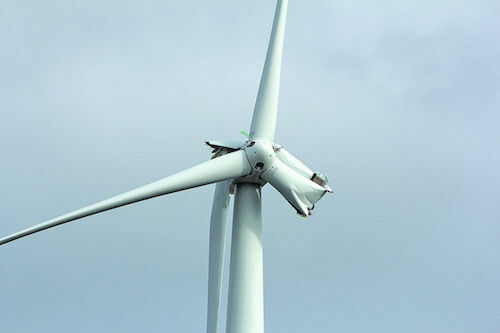 Lightning strikes have also jolted turbines. Along those lines, Dennis Buda, operations manager at DTE Energy who once called Huron County a “mecca for lightning,” said in August 2014 the utility had almost 17 blades that had been struck by lighting. In September 2013, a turbine near Minden City owned by Exelon Energy lost a blade after a lightning strike. Strikes in 2014 caused land and crop damage, forcing wind park owners to replace blades.